Affiliations: friends with Jennie & Koos Menning, often assisted by his foster father or by Inspector Van Dijk (former hiding mate, not in foreign adventures). Powers/Abilities: As ex-smuggler, technician, nuclear physicist and electronics expert, he is just a very highly skilled hero, with many very finely honed skills. He had built by himself the Pegasus, a small submarine (mainly for use in rivers), which he lost in the second book. With the money he got as a reward in that book he built the Salamander a red amphibious sportscar, which could be used as boat too. The Salamander was his usual means of transport in the series. History: Pim Pandoer was originally, in the first book in the series, an opium smuggler, but that was because those times were more innocent. 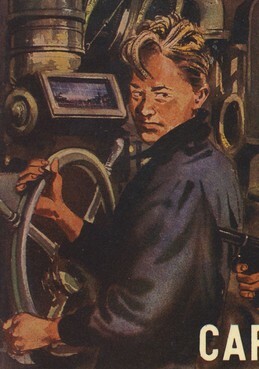 Pim Pandoer was on his way to becoming an evil villain, rather than just a smart guy making some money in a way not entirely legal, but a dramatic confrontation with his foster father in a sinking submarine saw his good side take over. The way he talks sometimes suggests that Fer and Pim are two personalities: there is a reason for that: His (sort of) family was taken from Amsterdam in WW II, and they all died in a camp as part of the Endlosung, except for 10 year old Fer, who escaped death in a miraculous way and ended up as the foster son of Bas and Marijke. That may have led to the development of the proud, competent, unforgiving, law breaking Pim Pandoer side of his character, while the more social Fer side stayed more friendly. Even after his conversion to hero, he is rather menacing as Pim Pandoer. There is no clue to how separate the personalities are, but Fer is for instance a much better loser than Pim, while Pim tends to be driven to avenge every slight against him. The reason that Fer went criminal was mainly that he was led that way by the German prisoner he escaped the camp and crossed Germany with. He was given to Van Dijk on the border, went into hiding with Van Dijk in the pig sty on the farm of Baanders, was there until the war ended, may very well have done something in the resistance, became the foster son of the Baanders after the war and studied a lot. Comments: Creator Carel Beke wrote the first book in the series with an adventure book for boys and girls in mind. To make it appeal to both sexes he had to create a very closely connected male/female pair of heroes, without any romance between them. He did this by taking twins as his protagonists. Jennie and Koos Menning were those twins, very close siblings. The villain, who was defeated by his own better sentiments, rather than with violence, became the hero of the series, rather than the well thought out protagonists with whom the kids could identify. He is the best example of a dark hero, a hero with a traumatic past, a vulnerable one with a thirst for vengeance in the Dutch long underwear crowd; the "Dutch Batman" had arrived. The Donkers were murdered as they were Jewish according to the Nazi laws - his father just because he had some Jewish ancestry (statement by Bas Baanders), but you weren't murdered for that, unless you were married to a Jew (i.e. somebody with 3 or 4 Jewish grandparents). The chance that Pim Pandoer himself is Jewish, no matter your definition, is pretty high, unless you take religion or self identification as definition: Pim Pandoer seems to be completely irreligious, not even atheistic or agnostic. He never identifies his family as Jewish either. Of course, it may just be that this dark avenger does not like to disclose details about his past. It may be an attempt to keep the books acceptable for boys and girls from all denominations, but that is a bit unlikely, as the other great hero of the publisher was a nice Roman Catholic Arizonan boy with slightly superhuman vision. More likely the reason is the avoiding of the complex emotions of somebody from a Jewish background (traditional or less), who had to deal with witnessing the murder on his entire family, had hidden in a pigsty with a cop, had been in the battle of Arnhem, who lived in a Christian world now and was searching for God. A very good reason to avoid this topic was that the identity of the foster parents of the surviving Jewish orphans, and mostly the religion in which they should be raised, after WW II was a politically sensitive topic, perhaps better not touched in a book for children. It has to be pointed out that in the series Pim Pandoer does not stand out as irreligious, his world is like that, so we could say that the author has left religious issues to the privacy of the characters. One movie based on the first two books has been made, and another for private use by a Scouting group in his base of operations, in which Pim Pandoer has become a Scouter in their group, but Pim Pandoer has not starred in comics. Profile written by Theodoor Westerhof.